This morning I’m hopping on a flight back to Dallas from a fun weekend with my friends in Utah! Rachel’s shower was beautiful (thanks to Emily! ), and it was so nice to just chill out and spend time with them! Because of my busy weekend away, I didn’t have time to properly promote this post I published over the weekend. Find out what workout brand has got me more motivated than ever when you click here to check out the post! Plus, the post highlights a fab event I’ll be hosting this weekend! Don’t miss it! Did you hear that Tibi is hosting an online sample sale? All you have to do is enter your email address here, and you’ll gain access to the sale which features some of their best pieces up to 80% off! Snag chic separates like this striped midi and matching crop top, this sleek open-back blazer and these classic slim-fit trousers. Also, be sure to take a peek at this pretty flounce-skirted dress and this pleated maxi. So adorable! Oh, and the shoes. You can’t miss these. And these. #8 is so pretty, I love your picks! Those are great colors for spring! Love the white sandals – so pretty!! Those boy shorts are just begging to be worn on a lazy Sunday morning! What a cute find! Love that Rebecca Minkoff tote as well as that pretty perforated clutch!! Love this fun pillow! I actually have the BKR water bottle in this color. They seriously offer so many colors to choose from it’s hard to pick. A friend gave me the Laguna Voluspa candle for my birthday, and I just love it! I definitely have a thing for pastels so loving all your picks! So pretty that shade of mint is divine! Great spring round up. I’m crushing on that denim!!! I have those LR sandals in black and beige… they are such a perfect spring staple!! I love these soft green picks! Definitely adding that bag to my wishlist. I adore #3 & #8! fabulous must have pieces for spring & summer. Loving all the mint. And those white sandals! Loving #s 1, 3, 8, and 12! I love the brightness of these colors, and can’t wait for warmth! Those white sandals are divine! Loving mint too. Such a fun edit! 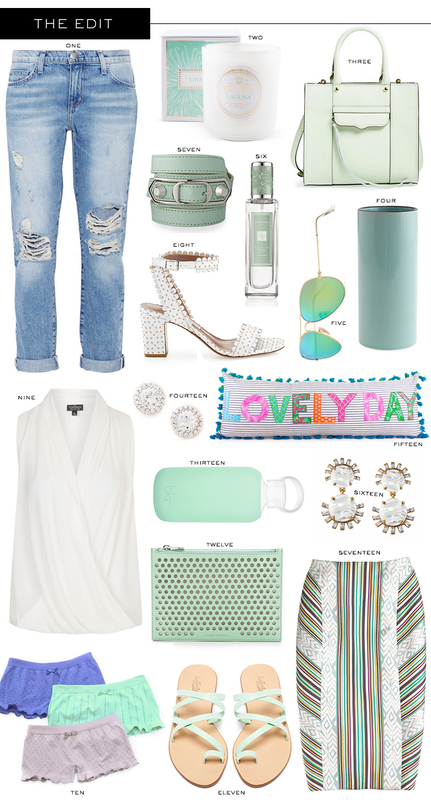 Love these shades of blue and mint.